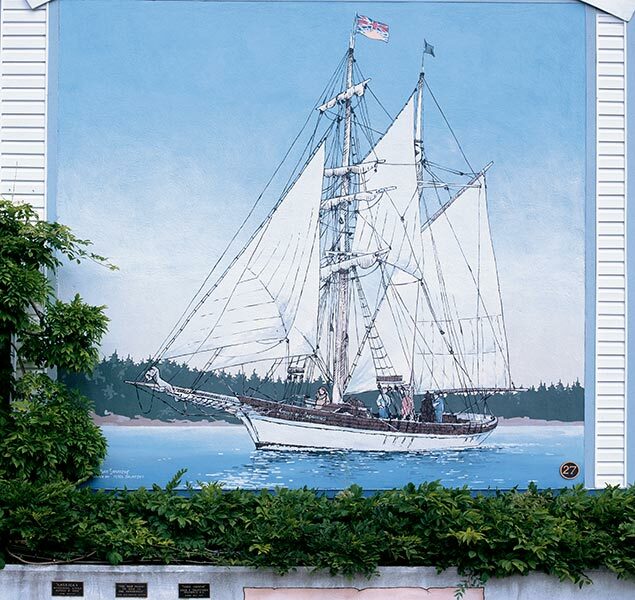 Hints of the pristine coastline, heavily treed and dripping green, peep out from behind a glimmering impressionistic image of the brigantine Spirit of Chemainus. The suggestion of activity on the deck, with five faceless figures, symbolizes an earlier time when such vessels were commonly seen in Chemainus Bay, and indeed all along the coast of BC. 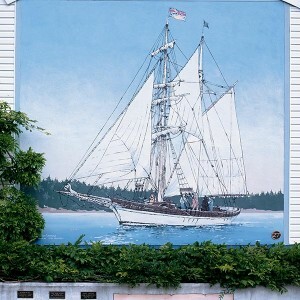 This sailing ship was built and launched in Chemainus in 1985 as an offshoot of, and a tribute to, the original Chemainus Festival of Murals. Constructed by master shipwrights, the fine lines and textured surfaces of the ship are captured in the muted colours of the mural.